Venezuelan President Nicolas Maduro was unhurt. Several drones armed with explosives were detonated near Venezuelan President Nicolas Maduro in Caracas Saturday in what he called an assassination attempt carried out by "far-right" opponents. A government official termed it an "attempt against the president." Maduro, who was unharmed, was speaking at a celebration of the 81st anniversary of the National Guard, when detonations from "various drones" near the presidential area and along the parade route occurred, Jorge Rodriguez, the Venezuelan Minister of Communication and Information, said on Venezuelan state television. "This was an attempt to kill me," Maduro said in a TV address to the country following the attack. "Today they attempted to assassinate me. "I stand, alive and victorious, ready to follow the battles and fights that touch me forever," he added. 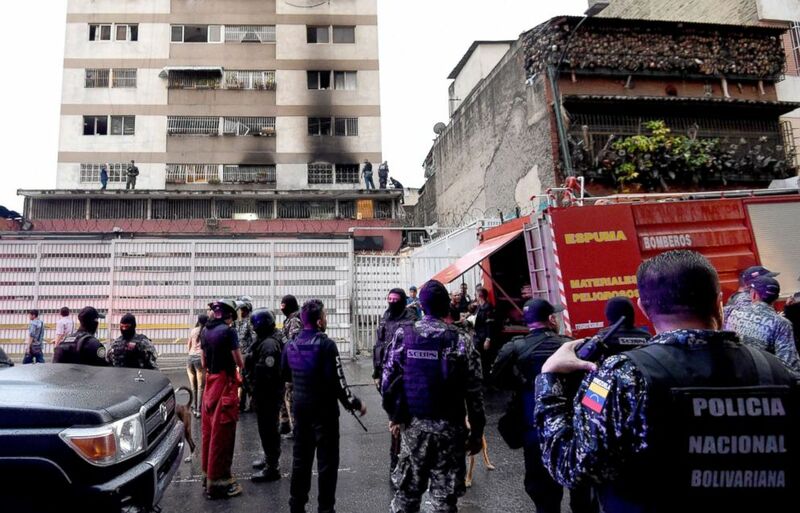 (Juan Barreto/AFP/Getty Images) Security forces and members of the Bolivarian National Intelligence Service check a building after an explosion was heard near the place where Venezuelan President Nicolas Maduro was attending a ceremony, August 4, 2018. Maduro said that he believes the Venezuelan far-right worked with the Colombian far-right in the attack. He also said Colombian President Juan Manuel Santos is responsible. He said that some of the orchestrators of the attack have been captured, and evidence has been seized. "This was an attempt against the president," Rodriguez said. "They failed and will continue to fail. He is in perfect health and shape." 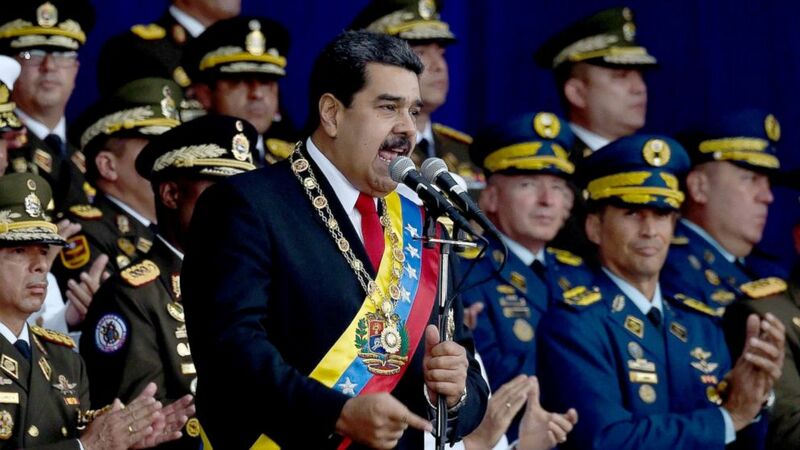 (Juan Barreto/AFP/Getty Images) Venezuelan President Nicolas Maduro delivers a speech during a ceremony in support of the National Guard in Caracas on August 4, 2018. Maduro, who Rodriguez said was evacuated from the scene, met with his generals and cabinet members after the explosion. In addition to far-right factions in the country, he blamed others in Bogota and Miami, and said he hoped that President Donald Trump would help "fight the terrorist groups." The minister said seven people were injured and were being treated for unspecified injuries at hospitals. 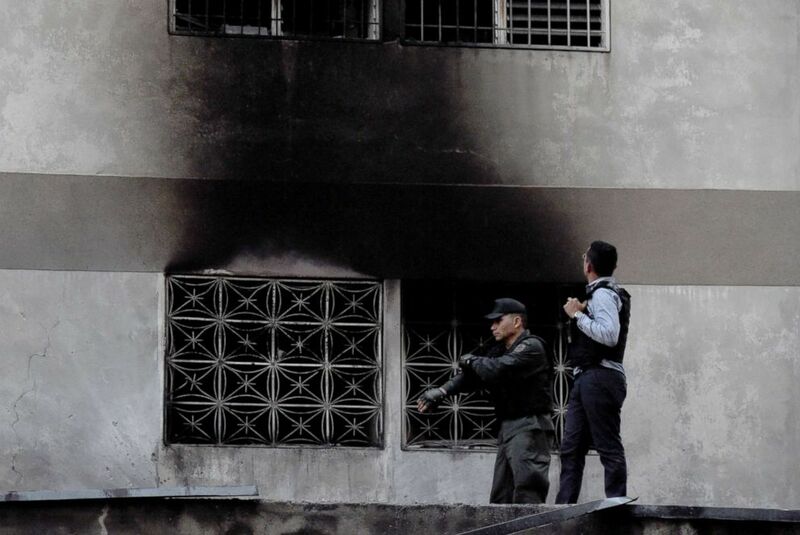 (Juan Barreto/AFP/Getty Images) Security forces check a building after an explosion was heard during a ceremony attended by Venezuelan President Nicolas Maduro in support of the National Guard in Caracas on August 4, 2018. The White House did not comment on the apparent assassination attempt Sunday, but Press Secretary Sarah Sanders said President Trump was brief prior to last night's rally in Ohio and again while flying back to Bedminster. Video from state television shows Maduro, wearing his presidential banner, speaking about the economy when he hears a noise. His wife, standing to his right, clearly ducks and looks up at the sky, apparently in the direction of the explosion. 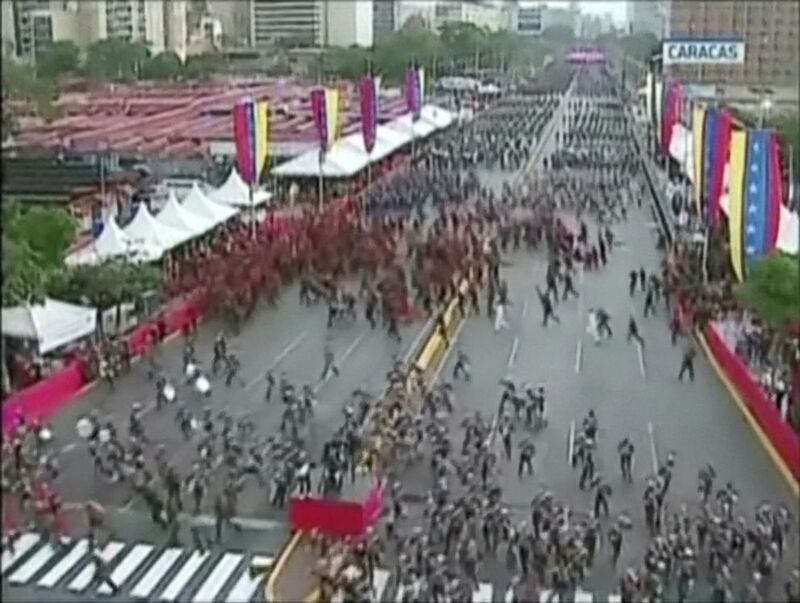 The soldiers lined up in front of Maduro can be seen breaking ranks and running before the transmission was cut. "The people are with the president," Rodriguez said. (Venezuelan Government TV via Reuters) In a still frame taken from video, Venezuelan National Guard soldiers run during an event which was interrupted, August 4, 2018,in Caracas, Venezuela. Maduro has served as the president of Venezuela since 2013 when he took over from strongman Hugo Chavez. Maduro was a close ally of the late Chavez, serving as president of the National Assembly, his foreign minister and vice president. He has faced a host of crises since he took office as his country has dealt with severe economic issues, hunger, rising crime and inflation. The country is given a Level 3 travel advisory, its second-highest, by the U.S. State Department, meaning Americans should not travel to the country. U.S. Embassy family members were evacuated in October 2017. The U.S. issued a new warning for Sunday, following the attack, saying, "U.S. government personnel have been instructed to shelter in place until further notice. U.S. citizens should seek secure shelter, keep a low profile, avoid crowds, and avoid demonstrations." ABC News' Jordyn Phelps and Dean Schabner contributed to this report.